Robots' potential to take over the world is a commonly expressed fear in the world of AI, but at least one Turing Award winner doesn't see it happening that way. Rather than replacing mankind, technology will create a new kind of human that will coexist with its predecessors while taking advantage of new tech-enabled tools. 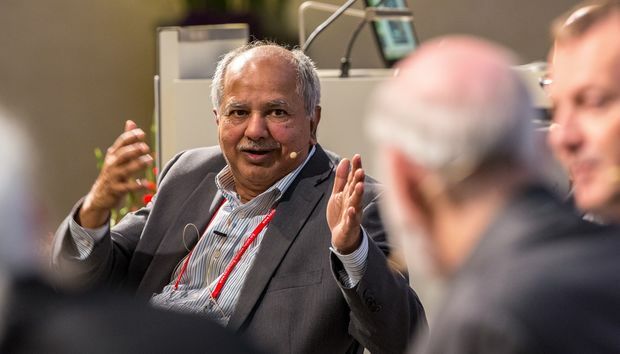 So argued Raj Reddy, former founding director of Carnegie Mellon University's Robotics Institute and 1994 winner of the Turing Award, at the Heidelberg Laureate Forum in Germany last week. "I could not have predicted much of what has happened in AI," Reddy told an audience of journalists at a press conference. "Four or five things happened in AI in the last decade that I didn't think would happen in my lifetime," including achievements in language translation and AI's triumph at the game of Go. Such victories have arrived early largely because computing power has advanced so rapidly, Reddy said, enabling capabilities that had been rejected as impossible not so long ago. Next, there will be a new step in human evolution where Homo sapiens evolves into what one might call "Homo connecticus," he said. The new species will likely look just like us, but will be enabled in new ways by artificial intelligence and other technologies. "It might not be genetic, but rather external, through tools," Reddy said. The next 30 to 50 years will usher in at least one more giant leap in computing power, he said. While futurist Ray Kurzweil has predicted the "singularity" around that time, leading to the demise of today's humans, "I don't think so," Reddy said. Instead, we'll eventually see the emergence of Homo connecticus. "They could theoretically kill everyone else, but we don't go around killing all the chimps and monkeys, even though we evolved from them," he said. "The same will be true with AI." This new species won't be competing for the same resources the way Homo sapiens and Neanderthals did. Accordingly, "they'll leave the rest of the people alone." Reddy doesn't expect this shift to happen within the next 100 years, but it may in the next 1,000, he said. "We should be prepared, but we shouldn't worry about it at this point," he said. "When it happens, it will be a peaceful coexistence." « Sonos comes to the Apple store, but what does that mean for Beats speakers?